From the late sixties, right through to the seventies, fusion was one of the most popular musical genres. Fusion was popular on both sides of the Atlantic. However, by the late seventies were tiring of the fusion of jazz and rock. This included former Deep Purple frontman Ian Gillan. In July 1978, Ian Gillan called time on The Ian Gillan Band, which he formed three years earlier in 1975. Since then, The Ian Gillan Band had released a trio of albums. Their debut was 1976s Child in Time. However, The Ian Gillan Band began two years earlier. That’s when vocalist Ian Gillan left Deep Purple. He played his part in the recording of Deep Purple’s 1974 album Who Do We Think We Are? It was released in America in January 1973, and a month later, in February 1973, in Britain. By then, Ian Gillan was exhausted. He and the band were desperately in need of a rest. That however, wasn’t going to happen. Deep Purple, one of the unholy trinity of British hard rock, were about to go out on tour. However, Deep Purple desperately needed a rest. Their management wanted Deep Purple to tour Who Do We Think We Are? Reluctantly, they agreed. So they headed out on tour. Before long, tensions arose within Deep Purple. By the summer of 1973, Deep Purple were in Japan. This was their second Japanese tour. Unlike their first tour, all wasn’t well within the band. Arguments arose between members of the band. Lead vocalist Ian Gillan and Bob Glover clashed with guitarist Richie Blackmore. Whatever had happened or been said, there was no going back. Ian Gillan and Bob Glover quit Deep Purple in June 1973. On his return home, Ian Gillan announced he had retired from the music business. He wanted to focus on other business ventures, including a business building motorcycle engines, a country hotel ands the Kingsway Recording studio. However, Ian didn’t stay retired for long. By April 1974, Ian was using the Kingsway Recording studio to begin work on his first solo tracks. He debuted them at Roger Glover’s Butterfly Ball at the Albert Hall, on 16th October 1975. This whet Ian’s appetite. Before long, he was putting a new band together. It eventually became The Ian Gillan Band. The Ian Gillan Band-Child in Time. Originally, Ian called his new band Shand Grenade. This was a combination of Shangri-la and Grenade. The name didn’t go down well with his management. They managed to persuade Ian to change the name to The Ian Gillan Band, which was an Anglo-American band. The first lineup featured the rhythm section of drummer and percussionist Mark Nauseef, a native of New York. The rest of the band, including bassist John Gustafson and guitarist Ray Fenwick were British. So were keyboardist Mike Moran and Ian, who added vocals and harmonica. They headed to the Musicland Studios in Munich, which was then, one of the most famous European studios. That’s where The Ian Gillan Band recorded their debut album Child in Time. Recording took place between December 1975 and January 1976. Seven songs were recorded, including six which were penned by members of The Ian Gillan Band. Then once Child in Time was completed, the album was mixed at Mountain Studio, Montreux, February 1976. Five months later, Child in Time which was produced by Roger Glover, was ready for release. Child in Time was well received by critics. That’s despite the change in style. Ian Gillan was no longer the hard rocking musician of his Deep Purple days. The Ian Gillan Band had turned their back on rock, in favour of fusion and even, funk. This shocked fans of Deep Purple. Especially when Deep Purple fans realised that Child In Time, a Deep Purple classic, was given a funky makeover. This was perceived as an act of sacrilege. It certainly didn’t help sales of Child Of Mine, which was released on Island. When Child in Time was released in July 1976, it reached number fifty-five in Britain. Elsewhere, Child in Time reached number thirty-six in Sweden. Little did Ian Gillan and rest of The Ian Gillan Band realise, that that was as good as it got for them. After the release of Child In Time, The Ian Gillan band returned to the studio in July 1976. Right through to September 1976, they recorded the six tracks that became Clear Air Turbulence which doesn’t feature in The Album Collection. Once the album was completed, The Ian Gillan Band were set to head out on tour. That never happened. While the concerts were scheduled, and the tour promoted, it was eventually cancelled. Things weren’t going well for The Ian Gillan Band. It was just about to get worse. Ian Gillan wasn’t happy with Clear Air Turbulence’s sound. So much so, that the album’s release was postponed. This allowed Clear Air Turbulence to be remixed. Once the remixing was completed, the release of Clear Air Turbulence was schedule for April 1977. On the release of Clear Air Turbulence, reviews were mixed. The Ian Gillan Band experimented on Clear Air Turbulence. Hard rock, prog rock and fusion sat side-by-side. Some critics felt this didn’t work. However, on tracks like Money Lender and the jazz-fusion of Over The Hill and Goodhand Liza, The Ian Gillan Band find form. However, this was too little too late. When Clear Air Turbulence was released on 15th April 1977, it wasn’t a commercial success. For Ian Gillan this was a huge disappointment. All his efforts had been in vain. Scarabus which is also omitted from The Album Collection, proved to be The Gillan Band’s swan-song. The ten tracks had been recorded at Kingsway Recorders, London, between July 1977 and August 1977. Three months later, Scarabus was released. When the critics heard Scarabus, they were disappointed by what they heard. Ian Gillan seemed ill at ease by Scarabus’ somewhat contrived jazzy sound. Critics longed for Ian to kick loose. He never does. Even when Scarabus heads in the direction of rock, it’s more like faux rock. So, it’s no surprise that Scarabus was the weakest and least successful album by The Ian Gillan Band. On its release, Scarabus wasn’t a commercial success. It didn’t trouble the charts. For The Ian Gillan Band it was a disappointing end to their career. However, before long, Ian Gillan was back to his hard rocking best with a new band, Gillan, who recently released a box set Gillan-The Album Collection, on Edsel. With The Ian Gillan Band history, Ian Gillan began the next chapter in his musical career, Gillan. It saw Ian return to a much harder, rocky sounding style of music. For Ian Gillian, this was what he did best. His new band Gillan featured a familiar face and some new names. The only member of The Ian Gillan Band that joined Gillan was Colin Towns. He was joined by guitarist Steve Bryd, bassist John McCoy and drummer Pete Barnacle. However, although Pete featured on Gillan’s eponymous debut album, he was soon replaced by Liam Genockey. This was just one of several changes in Gillan’s lineup over the next four years. With his new band in tow, Ian headed to what were familiar settings, Kingsway Recorders, in London. That’s where the ten tracks that became Gillan, were recorded between July 1978 and August 1978. Gillan would be released in September 1978. Straight away, there was a problem. Gillan didn’t have a record deal in Britain. However, Gillan had a record deal for Japan, Australia and New Zealand. So, Gillan was only released in these three countries. On the release of Gillan it sold well in Japan, Australia and New Zealand. That wasn’t surprising. The reviews of Gillan were positive. So were the reviews in the British music press. However, with Gillan unavailable in Britain, it had to be imported from Japan. This lead to Gillan being referred to as The Japanese Album. When copies of the album arrived, it quickly became apparent that Gillan marked a return to form from Ian Gillan and his hard rocking band. They weren’t going to be long without a recording deal in Britain. That proved to the case. By the time Gillan returned to Kingsway Recorders in April 1979, Gillan had signed to Acrobat. For the next two months, the classic lineup of Gillan recorded the ten tracks that became Mr. Universe. By the time of the Mr. Universe sessions, Gillan were already onto their third drummer. Mick Underwood was Gillan’s drummer, having replaced Liam Genockey. Mick was joined in the rhythm section by bassist John McCoy and guitarist Berne Tormé. Colin Towns played keyboards and flute and Ian Gillan played harmonica and added vocals. This is regarded as the classic lineup of Gillan. The new lineup of Gillan worked hard for the next two months. Eventually, by June 1979, Mr. Universe was completed. Gillan were ready to release what was their first British album. Prior to the release of Mr. Universe, critics were sent a copy of Gillan’s sophomore album. For Ian, this was a worrying time. Latterly, during his days with The Ian Gullan Band, the critics hadn’t been kind to him. That wasn’t the case with Mr. Universe. The critics were won over by Gillan’s hard rocking sound. They were pleased to hear Ian Gillan back what he did best. Equally happy were the record buying public. When Mr. Universe was released in October 1979, it reached number eleven in the British charts. Ian Gillan had just announced his return. He wasn’t going anywhere. After the success of Mr. Universe, Ian Gillan was keen to strike while the iron was hot. So, having toured Mr. Universe, work began on Gillan’s third album, Glory Road. Recording of Glory Road began in April 1980. For two months, Gillan were locked away at the studio Ian built, Kingsway Recorders. That’s where he had recorded all The Ian Gillan Band and Gillan albums. It’s where Gillan recorded the ten tracks that became Glory Road, the album they hoped would give them their first transatlantic hit. After the success of Mr. Universe in Britain, Gillan were determined to crack the lucrative American market. Ian knew, that was where the big money was to be made. His time with Deep Purple showed him the riches that were capable of being made in America. However, in hoping to break America, this presented a problem. Many bands didn’t release the same version of their album in America. That was the case with Glory Road. The running order was different, and Your Mother Was Right replaced Sleeping on the Job. The release date was scheduled as October 1980. Before the release of Glory Road, the critics had their say. For any band, this can be a nervous time. A bad review can prove costly. Fortunately, most of the reviews of Glory Road were positive. Granted, there were a few dissenting voices. Mostly, though, Gillan looked as if they were heading down the Glory Road. When Glory Road was released, in October 1980, Gillan fans made a beeline for the limited edition double album. It contained the free album For Gillan Fans Only, which can also be found in The Album Collection. Most fans had to settle for ordinary version of Glory Road. Plenty did. Glory Road became Gillan’s biggest selling album. Not only did it reach number three in Britain, but was certified solver. This made Glory Road Gillan’s biggest selling album. However, that wasn’t the end of Glory Road’s success. In America, Glory Road crept into the US Billboard 200, reaching 183. This was the first time a Gillan album had charted in America. Were Gillan about to crack the lucrative American market? Buoyed by the success of Glory Road in both Britain and America, Gillan set about recording the followup. The last few months had been among the busiest in Gillan’s career. What with promoting Glory Road in Britain and America, plus a gruelling touring schedule, Gillan had hardly any time to think about their fourth album, until now. Just like previous albums, Gillan headed to Ian’s studio, Kingsway Recorders, in London, UK. The recording began in December 1980. After breaking for Christmas and New Year, Gillan returned to Kingsway Recorders in January 1981. They finished their fourth album later that month. Much of what became Future Shock was penned by Ian, John McCoy and Bernie Tormé. This included the title-track. It was was inspired by Alvin Toffler’s book Future Shock. As for Future Shock’s distinctive artwork, it was created by Alan Daniels for Young Artists. With its eye-catching, futuristic image, Future Shock was guaranteed to grab record buyers attention. So was the music. Before Future Shock was released in March 1981, the critics had their say. They were one over by Future Shock. So much so, that they called Future Shock one of the greatest hard rock albums. This bode well for the release of Future Shock. When Future Shock hit the shops, it became Gillan’s biggest selling album in Britain. Future Shock reached number two, and was certified silver. However, across the Atlantic, Future Shock failed to chart. This was a disappointment. After all, America was the most lucrative market. Especially, for hard rock. Sadly, it looked like Gillan were never going to be as successful in America, as they were in Britain. Just seven months after the release of Future Shock, Gillan were back with their fifth album Double Trouble. Unlike previous albums, it was a double album. However, this was a double album with a difference. For their fifth album, Gillan had decided to release a double album. The first album contained studio recordings, while the second album featured Gillan live. Double Trouble had been recorded during 1981, just as Gillan’s lineup was changing. Gillan had returned to the studio in August 1981. This was the first time since Bernie Tormé had been sacked. Gillan had been asked to play on British pop show Top Of The Pops. Their single No Laughing in Heaven had charted. However, Bernie didn’t want to play on Top Of The Pops. So he was sacked. Bernie’s replacement was Janick Gers. he featured on the eight tracks recorded at Kingsway Recorders. However, Bernie featured on If You Believe Me, which was recorded at the Rainbow Theatre, London on 4th March 1981. The remainder of the live tracks were recorded at the Reading Festival, on 29th August 1981. These live tracks showcased what Gillan in concert sounded like. For Gillan, Double Trouble was akin to their calling card. It featured studio recordings and live tracks. This was the perfect introduction to Gillan. However, it was always risky releasing a hybrid album like Double Trouble. Other groups had tried this. For some groups, it worked, and worked well. However, for other groups it backfired on them. They were accused of throwing together an album. So, were Gillan risking their reputation with Double Trouble? That proved to be the case. The critics weren’t impressed with Double Trouble. Reviews were mixed. It seemed Gillan’s decision to combine studio recording and live tracks on Double Trouble seemed to have backfired. When Double Trouble was released in October 1981, it reached number twelve in Britain. After the mixed reviews, the members of Gillan breathed a collective sigh of relief. The Gillan success story continued apace. Nine months after releasing Double Trouble, Gillan returned to the studio in July 1982. At Kingsway Recorders, in London, Gillan began recording what would become Magic. A total of eighteen tracks were recorded between July and August 1982. However, only ten made the cut. They became Magic. With Magic completed, Gillan’s sixth album was scheduled for release later in 1982. However, before that, the critics had their say. Just like Double Trouble, Magic failed to excite the critics. They weren’t won over by Magic. The reviews were mixed. This didn’t bode well for Magic. On its release, Magic reached just number seventeen in Britain. This was Gillan’s least successful album in Britain. It was also their last. The end was neigh for Gillan. Not long after the release of Magic, Black Sabbath were looking for a new lead singer. This was a huge opportunity for someone. Black Sabbath knew who they wanted. The chosen one, was Ian Gillan. It was an offer Ian Gillan couldn’t refuse. Still, Black Sabbath were one of the biggest names in rock. So, he disbanded Gillan became the new lead singer of Black Sabbath. Ironically, his new job didn’t last long. Ian Gillan’s time with Black Sabbath lasted just one album and one tour. Then Ian Gillan returned home. He rejoined Deep Purple, the group where he started his career. Gillan was now history. Gillan lasted four years. During that period, they released six albums. Five of these albums were released in Britain, and reached the top twenty in the album charts. The two most successful albums were 1980s Glory Road and 1981s Future Shock. Both albums were certified silver. Along with Gillan’s 1978 eponymous debut album and 1979s Mr. Universe, these albums feature Gillan at their hard rocking best. Each of these albums, plus 1981s Double Trouble and 1982s Magic, feature in the Gillan-The Album Collection box set, which was recently released by Edsel, a subsidiary of Demon Music Group. 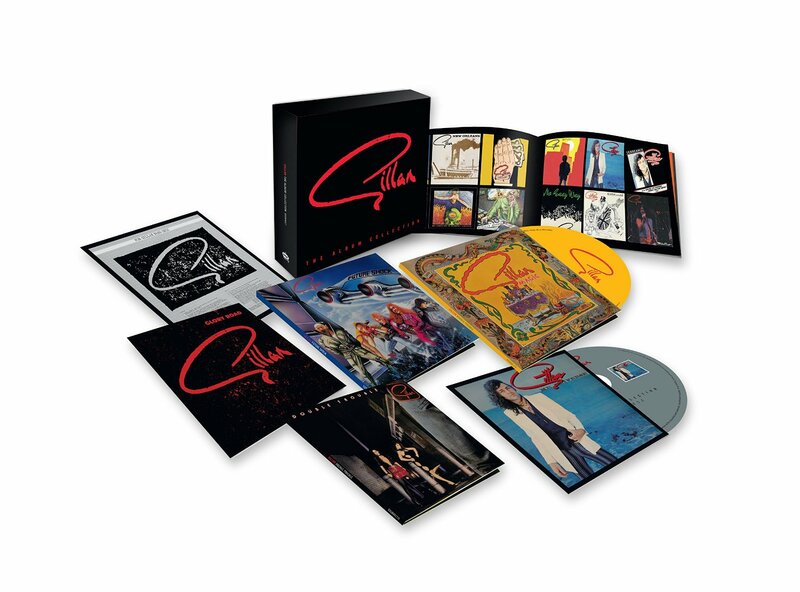 The Gillan-The Album Collection box set is a welcome reissue. However, there’s several buts. Missing from the box set is Gillan’s 1978 eponymous album. That’s probably down to licensing issues. However, it’s a shame that Gillan is missing from the box set. Another complaint is the the albums haven’t been remastered. Most likely, the albums are the 2007 reissues. Granted they were remastered back then, but eight years have passed since then. A sympathetic remastering wouldn’t have gone amiss. As for the packaging and sleeve-notes, they leave a lot to be desired. They leave you thinking that this is very much a low budget product. However, what matters is the music. Gillan-The Album Collection finds Gillan at their hard rocking best. Quite simply, it’s a joy to behold. That describes Gillan on Mr. Universe, Glory Road and Future Shock. They don’t hold back. In full flow, they’re torchbearers for British rock. As rock goes, it doesn’t get much harder or heavier than Gillan. They were one of the last great British rock bands, and were responsible for rebuilding Ian Gillan’s career. After the disappointment of The Ian Gillan Band’s last two albums, Ian Gillan’s career was at a crossroads. When he formed Gillan his reputation had taken a bruising. Four years later, Ian Gillan had reinvented himself. His jazz-fusion years were long gone. Ian Gillan was back to his hard rocking best with Gillan, whose rise and rise is documented and celebrated on Gillan-The Album Collection. ← EMERSON. LAKE AND PALMER-TRILOGY (DELUXE EDITION).